From the moment Russia was awarded the 2018 World Cup, calls to boycott the tournament from Western media have rarely ceased. Whether these claims translate into discontented states refusing to participate, or calling for Russia to be deprived of hosting the tournament, is still unclear. Should, however, it mean the latter – which is largely considered as the more damaging of the two – then stripping Russia of the right to host football’s most prestigious tournament will serve only to further alienate Russia from the international diplomatic arena, fortify Vladimir Putin’s claims that Western imperialism is a real threat to Russia and, more importantly for Western powers, it will be a missed opportunity to shine a blinding light on Putin’s Russia, which has the potential of mobilising Russia’s ‘have nots’ and toppling the regime as a consequence. Regarded increasingly by many Western media today as a “rogue state”, Russia under Putin’s Czar-like grip has been criticised over its draconian laws regarding homosexuality and the use of social media, a culture of rampant corruption that preys on the vulnerable and prehistoric racist attitudes which too often manifest themselves within Russian football stadia. Whether Russia is a suitable choice to host the 2018 World Cup is indeed a real concern that demands deeper scrutiny. Should football, however, be used as a means to punish states when aimed at perpetrators of geopolitical crimes, proven or otherwise? 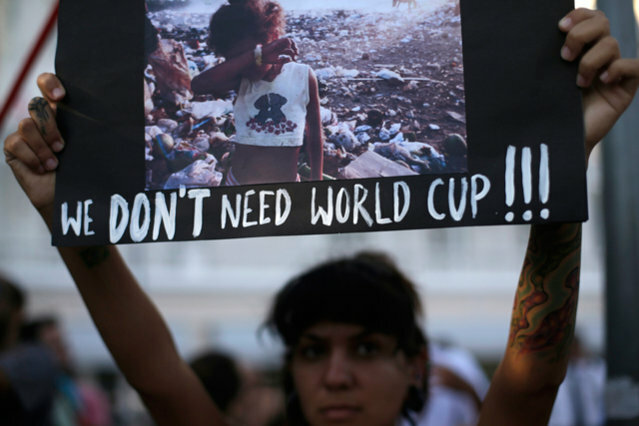 And, if Russia was to lose the right to host the 2018 World Cup, who in fact would suffer the most as a result? The recent downing of Malaysia Airlines Flight MH17 over rebel-occupied territory of Eastern Ukraine served as a red line for many across the Western world on the events in Ukraine that appeared to have reached a crescendo in a revolution in February, and which have since spawned into a polarised civil war. While investigations continue among the debris in the village of Hrabove, 100 kilometres from Donetsk, the West appear in little doubt regarding who is to blame for the attack. 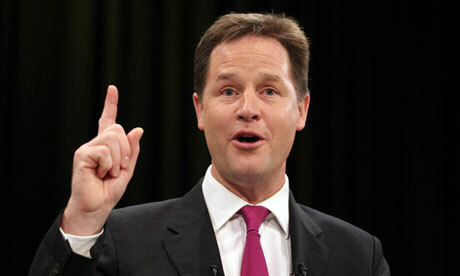 Last week, the UK’s Deputy Prime Minister Nick Clegg wriggled his way into the headlines when he exalted that it would be “unthinkable” for Russia to host a sporting event of the World Cup’s stature and that measures threatening Russia’s right to host the tournament, would serve as a “very potent political and symbolic sanction”. Many spectators concurred, including the Independent’s Jack Gilbert whose headline ‘To punish Putin for the MH17 disaster we must boycott Russia 2018’ also served as a time-saving rubric. Interestingly, British Prime Minister David Cameron and the Netherlands, who lost 193 citizens in the attack, released statements calling it “premature” to discuss such calls for a boycott. In response to calls for boycotting Russia 2018, FIFA have unsurprisingly shuffled their platter of generic press release statements and have conjured that the World Cup should be seen in this case as a “force for good”. And while avoiding a boycott or the need to change the World Cup venue is ultimately beneficial to football’s Geneva-based governing body, on this occasion FIFA may be, albeit unwittingly, correct. If Russia were to be stripped of the 2018 World Cup on the back of the Malaysia Airlines MH17 tragedy, what kind of precedent would be set? In sum, a sui generis one, which feeds seamlessly into Putin’s overarching rhetoric about the West and its double standards. For instance, opposition would understandably mount on the USA’s planned bid for the 2026 World Cup on similar geopolitical grounds. Would football therefore be left with the likes of perennial fence-sitters Switzerland and Norway every four years? In any event, it seems unclear whether World Cup sanctions would truly punish Russia financially. For instance, reports stating the overall positive impact of tournaments are generally concocted by organisations hired by hosts’ governmental agencies. As such, there is an incentive for such reports to produce positive projections and to swiftly turn the other cheek when nefarious allegations such as corruption are raised. In addition, for every positive financial factor such as job creation, tourism, merchandise, and non-tangibles like “feel-good factors”, which some claim to boost productivity on the basis of the increased levels of happiness in the build-up and during a World Cup, there are other measures against which the overall financial impact must be weighed. While projected stadium costs may read one figure, the real price is invariably higher. The Sochi Olympic Games, for example, characterised Russia as having the economic prudence of an oligarch’s irksome mistress, where the total cost of the event spiralled from a planned $12 billion to a crippling $51 billion, bankrupting construction companies along the way, with The New Yorker describing it as the “greatest financial boondoggle in the history of the Games.” For the 2018 World Cup, $20 billion is the estimated budget, making it the most expensive World Cup ever (South Africa 2010 cost $6 billion with an original estimate of $4 billion, with the 2014 World Cup in Brazil costing up to $13.6 billion, up from the original estimate of $9 billion). But the costs, as history proves, will be higher in reality. Moreover, while the 2018 World Cup will attract many new visitors, non-football fans as a consequence will likely avoid travelling to Russia. For the South Africa World Cup in 2010, 309,000 visitors entered the country during the World Cup, whereas the monthly average for the rest of the year was 620,000. Meanwhile, the cost to gentrify specific areas, making them more palatable to World Cup guests, as Operation Pacification proved in Brazil, was neither cheap nor effective. Then there are the expenses Russia will incur in order to ensure security against its internal threats, which largely originate from the North Caucasus region. Thus, questions of World Cup costs and its overall worth depend heavily upon the person being asked and on what Russia hopes a successful tournament will achieve. But as a money-spinner, arguments that Russia will be enriched by football’s main event remain unconvincing. Putin’s hypnotic rhetoric that Russia is a returning Empire, which needs to be fearful of all Western approaches, would find further vindication should this (unlikely) call for boycotting be met with any substance. The West must take serious note that Putin’s popularity ratings have soared since Russia’s handling of the situation in Ukraine, especially with regard to the annexation of Crimea, with nationalistic attitudes concomitantly on the rise. Sanctions such as to boycott Russia 2018 or to deprive Russia of hosting the tournament are unlikely to damage Russia financially as many have speculated. Moreover, it will serve to isolate further an already isolationist country. Much of Putin’s popularity arises from feeding his populace suspicions of the West, fears that are indeed wholly reciprocal. Opening Russia to the West, with particular emphasis on the likes of cartologically-challenged Kaliningrad, would be one way of boiling down these media-driven stereotypes that the old Cold War foes have about one another. Moreover, the more Machiavellian may be aware that Putin should be careful of what he wishes for. 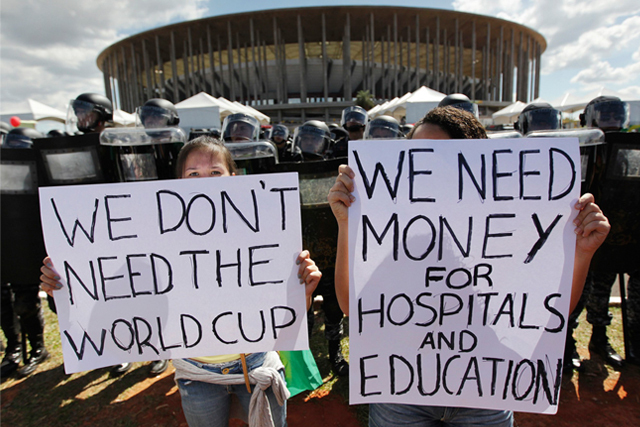 The world’s glare is already fastening on Russia and its preparation for the world’s greatest sporting event, with Brazil 2014-styled protests a model to follow for the Russian people. A growing complaint against the state’s wanton spending for a tournament with largely cosmetic value can become a catalyst to unite Russia’s ‘have nots’ against Putin, which will pose a greater threat to the self-declared Czar than anything the West can currently muster.